A lucky strike of fate had us walking up Albion Street right on midday when we caught sight of Rose Milk Food Store. In we walked to this newly opened cafe with the plan to grab a coffee and run, but one glimpse of their menu had us pulling up a seat in their intimate dining area. Full of natural light, the minimalist space is all white with the only hint of colour coming from a striking Rose Milk neon light on the back wall. With the kids in tow, we were travelling with two large strollers and despite taking up a bit of space, our lovely hosts were very accommodating, moving a few things around to get us in and seated. The all day menu is composed of mainly breakfast/brunch options, however it is supported by a decent specials menu. Although on the smaller side, what it lacks in size it makes up for in substance. No, there is nothing ground breaking or incredibly inventive, just the current cafe staples – baked eggs, avo on toast, corn fritters ect – done with a bit of a difference. 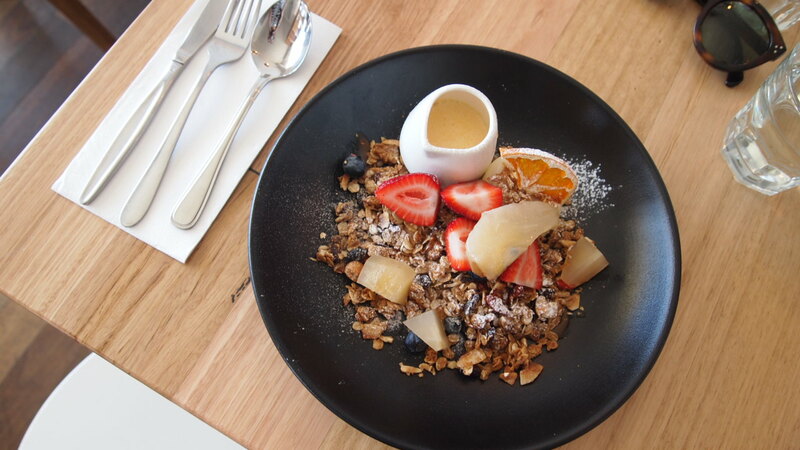 After a quick scan I was immediately drawn to the house roasted maple syrup granola with almonds, walnuts, goji berries, coconut flakes served with a vanilla pannacotta, salted caramel, seasonal fresh and dried fruits and vanilla anglaise. Almost bordering on being a dessert, this dish was right up my alley. There was nothing about it I didn’t like. The granola was divine. 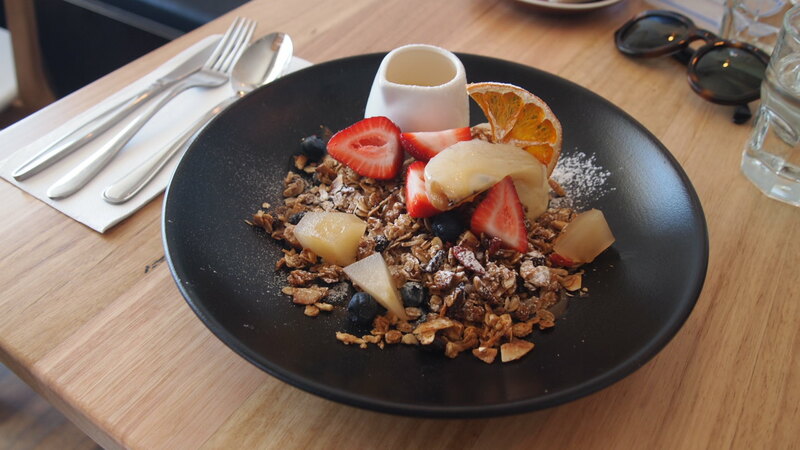 Perfectly roasted, it was crunchy, sweet and contained the right mix of nuts, oats and fruit. Beneath the granola sat a bed of sticky salted caramel which came as a nice surprise as I shovelled the delicious granola into my mouth. The pannacotta was also great, smooth, creamy and again sweet. There wasn’t really anything to cut through the sugar, so if you’re not a fan of sweeter dishes this probably isn’t for you, but for me it was pretty much perfect. I’ll definitely be back for round two. Do they sell pantry items here? I wanna go. Also are they close to public transport? No it’s just a cafe. The tram runs down Pascoe Vale Road, but it’d be a walk down Albion Street to get there.